In 2013, important federal legislation was passed that affects all group health plans offering wellness programs. Final rulings on the use of incentives in wellness programs and the protection of an individual's health information are now codified and statutory. How will your wellness benefits be affected? 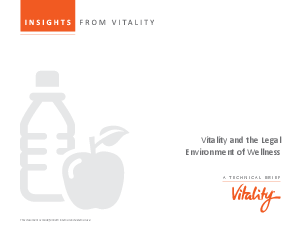 To examine these issues further, Vitality has created this brief to give employers a clearer understanding of federal wellness regulations and what it means to stay compliant. The brief addresses the impact of the Affordable Care Act (ACA), as well as other regulatory requirements such as HIPAA, GINA, the ADA, and more.